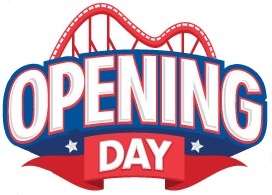 Welcome to Opening Day 2017 at Worlds of Fun. Check out that new front gate - it looks awesome. As has been the common trend in the past, several rides were not quite ready to open with the park. Some of the rides included Fjord Fjairlane (which had a complete overhaul this off season), Zulu, Timber Wolf and the two new rides. Falcon's Flight was seen doing a slow rotation but it never went skyward today. Mustang Runner did do a couple of full cycles but never opened. Maybe next weekend? A few other rides were having some issues as well. Only Tower 2 of Detonator was operational today, which led to artificially long lines for the ride. SteelHawk was being rather fussy as well with extended time between launches due to seat sensor issues. I was hoping this great ride would be less moody this year, but that doesn't seem to be the case so far. Patriot was running very well. I did notice that the crew has adopted a new "visual scan" approach that seems to take a longer time to launch trains. I hope they can speed that up with practice. Spinning Dragons was only launching a train after the train before it had completely finished the circuit and sat stacked in the brake run for a good minute or two. Not sure what that was about. Prowler seems to have received some attention this off season. They have a very sociable crew this year. I hope they can channel some of their energy into faster dispatches soon. MAMBA was running great and the crew was doing a decent job. Very little to no stacking with 2 train operations. Boomerang was being very temperamental. It was up for awhile then back down and then back up again and so on. The crew did a good job on dispatches when it was up. While several rides were still down, most were up and running. Fury was the only water ride running on Thursday. Viking Voyage opened on Friday. You have to admit that the newer rides sure do have great light packages. The two added this year are supposed to as well. Well that concludes Opening Day. We will see if the new rides are open next weekend.